Workman Publishing Company, 9780761119166, 392pp. “Cornbread? I LOVE cornbread!” For six years, that’s the response Crescent Dragonwagon got when people asked her what she was writing about. Over time, she came to understand: Not only is hot, just baked cornbread delicious, it evokes—powerfully—the heart, soul, and taste of home. There is an abundance of satisfying cornbreads, as Crescent discovered when she followed the cornbread trail from the Appalachians to the Rockies to the Green Mountains. Traveling to family reunions, potlucks, tortilleras, stone-grinding mills, and the National Cornbread Festival in South Pittsburgh, Tennessee, she heard the stories, tasted the breads, learned the secrets. 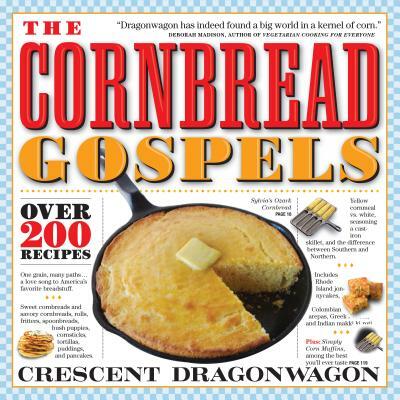 Join her in this overflowing cornucopia: over 200 irresistible recipes for cornbreads, muffins, fritters, pancakes, and go-withs. Cornbreads from below the Mason-Dixon line (Skillet-Sizzled Buttermilk Cornbread, Truman Capote’s Family’s Alabama Cornbread) meet those from above (Durgin-Park Boston Cornbread, Vermont Maple-Sweetened Cornbread). Southwestern offerings—Chou-Chou’s Dallas Hot Stuff Cornbread, delectable homemade tamales, and tortillas from scratch—meet internationals like India’s Makki Ki Roti. A Thanksgiving with Crescent’s Sweet-Savory Cornbread Dressing is rapturous. Desserts like Very Lemony Gorgeous Cornmeal Pound Cake make any meal exceptional. Along with this, Crescent gives us the greens, the beans, the salads, stews, and soups that accompany cornbread to perfection. And she tells us the stories, too. Enthusiastic and heartfelt, this thoughtful, exuberant love song to America’s favorite breadstuff and all that goes with it will embrace readers and cooks everywhere.